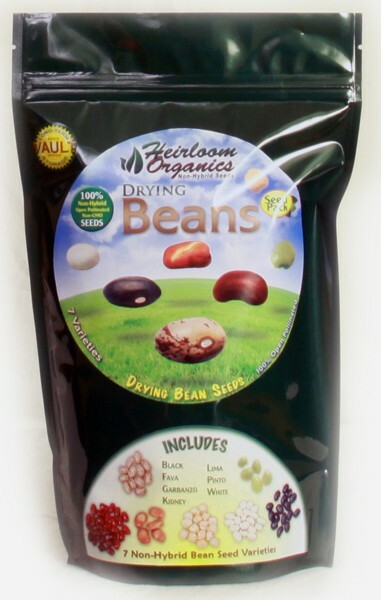 The Heirloom Dry Beans Pack from Heirloom Organics features the most common, easy-to-grow, nutritious varieties of drying beans available. America was built on beans and America will thrive on beans! Pinto beans are excellent for baked and bbq beans and Mexican refried beans. Black beans are a Tex-Mex favorite and Great Northern White beans are some of the best stew bean you can find. Lima Beans are a southern delicacy, while Fava beans and Garbanzo beans, or Chickpeas are Mediteranian favorites. The Heirloom Dry Beans Pack provides a delicious selection of beans which are 100% heirloom, non-hybrid (open pollinated) and non-GMO (genetically modified). For long-term food storage and sustainability, the Heirloom Dry Beans Pack is your choice.